EPIC Needs You! 7 May 2017 Please help us make our presence felt as the WODC Local Plan Examination begins this week in Witney. Thank you for coming along to meet us on May Day. It was encouraging to see such a good turn out (even if some of you may have been drawn by the Morris Dancers). On Tuesday 9 May the WODC Local Plan hearings will begin in the Council Chamber at Woodgreen in Witney. Last week, Eynsham Planning Improvement Campaign (EPIC) sent the letter below to the Planning Inspector to ask to be included in this process. Our request has been denied. For this reason we have no choice but to make our presence felt outside the hearings. Please come along to swell the numbers. Also, please spread the word. If you can help with making them, please get in touch. Here's looking forward to another EPIC turn out on Tuesday! We would be grateful if you would use your discretionary powers to allow the Eynsham Planning Improvement Campaign (EPIC) to make representations at the WODC Local Plan Examination, later this month and in July. We have submitted written statements but our request to participate in the hearings was refused on the grounds that we had not previously contributed to the Local Plan consultation. EPIC did not exist at the time of the Local Plan consultation. 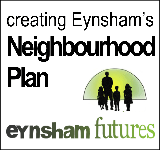 At that time Eynsham Parish Council and local residents were working on the Eynsham Neighbourhood Plan (ENP). They were not made aware of the Garden Village, Science Park and Western Extension proposals until late into the ENP process. In the face of these hugely significant additions, they did their best to respond within the limitations of ENP’s statutory framework. However, there simply wasn’t time to properly consult the village. Therefore, local people were not aware of the true scale of the new proposals. There has clearly been a serious democratic deficit. EPIC was formed as a response to this. We represent Eynsham’s views at this pivotal point in our history. For this reason, we believe that we need a voice at the Local Plan Examination. If we were not able to contribute to the debate through planning channels, we would be forced to find other means of representation. However, we hope you will grant us a seat at the table and a stake in shaping the future of our community.